English Episode 438: "The Poké Spokesman"
Satoshi-tachi are walking through the mountains when Satoshi notices something wrong with his Pikachu. 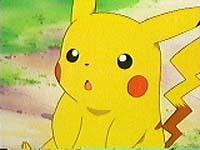 As everyone tries to figure out what's wrong, an elderly man comes up and starts to talk to Pikachu in pokemon language! The man, Lang, says that he is able to communicate with pokemon, and that he uses his services to pay to manage a rest stop. After an attack from the Rocket-Dan, the police come and announce that they're after Lang! They say that someone is going around, pretending to be able to speak to pokemon and taking trainers' money, and Junsa suspects Lang of being that person! Before he can be apprehended, a smoke bomb is thrown and Lang disappears! The smoke bomb was actually thrown by the gang who Junsa is after, and they take Lang to their cabin. They ask Lang to join them and help them make more money, but he refuses. Lang escapes and checks on Pikachu at the Pokemon Center before running from the cops, but the gang manages to track him down! Lang, talking to the gang's Coil and Reacoil, manages to convince them to stop their attack and turn on their trainers. With the real crooks captured, Lang is able to roam the land freely, practicing his communication skills. As he passes the Rocket-Dan's Nyasu, Lang is filled with new hope after being able to understand the cat pokemon. Hey, a good Jouto filler episode! Wow! The idea of a person who can speak to pokemon is interesting, and I think the anime producers pulled the whole thing off well. It's not like the other filler episodes, where Satoshi stops everything to help some random person he meets on the road. He goes to the Pokemon Center, heals his pokemon, and leaves, without hanging around or going out of his way to help someone. In fact, Satoshi doesn't really want to help Lang until the very end, thinking that he really is the crook everyone's after, and that distrusting attitude is very rare in Satoshi. The episode focuses on Lang instead, and it's a nice diversion from the usual Jouto filler. The only thing that bothered me is how Lang just kinda left the gang's hideout. We never see him escape or anything, making us think that he was just let go. It makes me wonder why the gang would compromise the location of their base by letting this man free. Did they want to be arrested? Lang's name (which is actually spelled "Rangu" in Japanese) is a pun on the word "Language." Fitting, isn't it? The dub renames him Simon, and that just doesn't have the same impact, now does it? Wow, this is the second Jouto League episode in a row that I have edits that I can report about. I know it sounds bad, wishing for 4Kids or Kids' WB! to edit the show more, but from a comparison standpoint this is one boring season. 4Kids replaced a LOT of the music in this episode, more so than usual. The Japanese episode used a lot of music from the previous movies, and it really fit the mood in the scenes it was used it. The music really gave a menacing tone to the crooks going after Lang, while the dub had the same old generic music that they always use. Well, Junsa revealed that Yamato and Kosaburou have not only broken out of jail, but they also had the time to pose for their wanted posters ^_^. Here's something I didn't expect. In the Japanese version, after Musashi and Kojirou tip toe away from the cabin window after planning to kidnap Lang, they actually follow through with their intents. Kojirou gets out a big three-rocket bazooka and fires at the cabin. Two of the rockets hit the roof, which surprisingly don't cause any damage at all. Musashi tells Kojirou that there were supposed to be three rockets, not two, and as everyone wonders where the third one vanished to, it falls out of the bazooka and lands next to Nyasu. The rocket explodes, and Musashi-tachi are sent blasting off. You can look at screencaps taken from the deleted scene here. In the dub, we only see Jessie and the gang tiptoe away from the cabin, and then we cut straight to the Pokemon Center where Pikachu's resting. The only reason I could think of for this scene being cut was because Kids' WB! didn't like the imagery of two rockets hitting a building, especially since nobody in the building seemed to notice. It's amazing, because I think Kids' WB! is the only network who's still censoring its shows because of 9/11. I don't know if this scene was shown in other countries and this is just a Kids' WB! thing (wouldn't be the first time), but it's an odd edit.